You read that right! It does say snail moisturiser. When I was asked if I'd like to try this I was like "I've heard of snake this and bee that but snail's a new one to me!" My next thought was "oh what the hell, I'm open to giving anything a go that will make me look gorgeous!" I meant even more gorgeous obviously. Anyway, this moisturiser is by skinChemists London who are a family run business going back years but in the last few years became famous for their wrinkle killer snake serum followed by bee venom. Their 'really do work' cosmeceutical products have been featured in numerous magazine all over the globe with celebs rating them very highly. Don't worry it's not a load of crushed up snails in a pot! 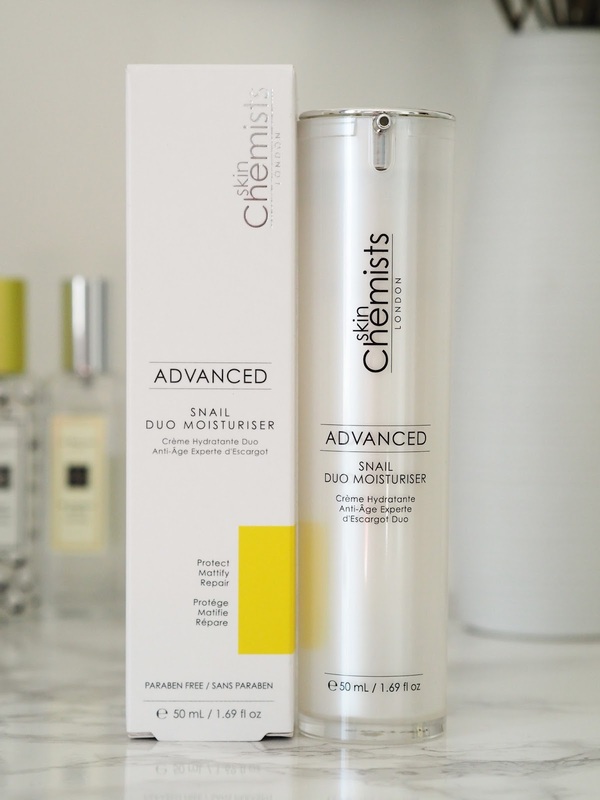 skinChemists Advanced Snail Duo Moisturiser, for morning and evening use, aims to leave the skin smooth, protected and hydrated. 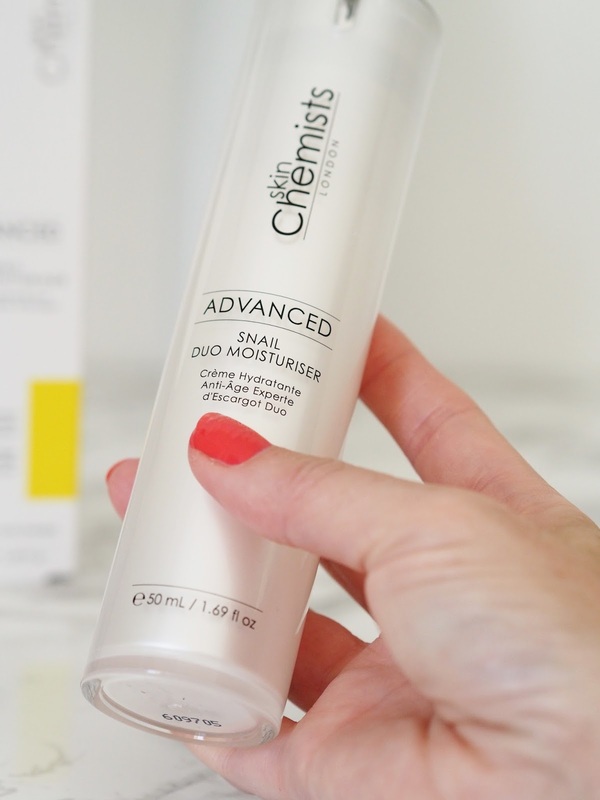 Snail Secretion, derived from the natural defensive liquid secreted by snails aims to delay premature ageing of the skin, whilst reducing visible age spots and providing protection from free radical damage. Tiare Flower Extract is combined with light and silky coconut oil, working to hydrate, repair, soothe and purify the skin. Vitamin E Acetate aims to leave the skin moisturised, whilst providing further protection against skin damage from environmetal aggressors. Creatine is formulate to immitate an amino acid found naturally within the skin, it aims to revitalise cell energy metabolism, whilst hydrating and protecting the skin. I wanted to give this product a really good trial before I reported back to you guys and I'm pleased to say this gets a huge thumbs up. First of all and a big plus is that it smells bloody amazing, almost tropically fruity. Now snails don't smell at all tropical so I can only assume that must have something to do with the coconut oil and the Tiare flower extract? I love that this comes in a pump dispenser, no putting fingers into pots, BUT the only problem with that is that you have no clue how much you have left. The texture of this cream is quite thick but it doesnt feel thick and heavy on the skin at all. It soaks into the skin beautifully leaving no residue, and has a matte finish with no greasy shiny looking skin in sight. This claims to moisturise the skin deeply and for me it did exactly what it says on the tin. However, after using it for about two weeks my husband got wind of this new product and was intrigued. Needless to say I found it most nights on his bedside table and then it got to living there permanently. Mr C has lost a fair bit of weight in the last year (good thing) which in turn has left the skin on his face a little on the saggy and wrinkly side (bad thing) but this product has helped no end. Actually scrap that, it's made a huge difference to his skin. So much so that I can tell when he's not used it and I'm like "Err....why have you not moisturised today?! "After applying his skin looks nourished and hydrated and more than anything it plumps up his skin making it look healthy. Mr C loves it that much he's asked me to order him some when this runs out and let me tell you that's high praise indeed because he'll normally just use what's lying around or what I throw in his direction. Other great things about skinChemists are that their products are 100% organic, they are cruelty free and all ingredients are ethically sourced. Great products that work often come with a higher price tag and I'm not going to lie they are expensive and perhaps out of most peoples price range BUT the amazing thing is the generous people there have given me a discount code for you guys so instead of paying £72 pounds you can try the snail moisturiser for just £24.99. You'll find more info on the product here and order using the discount code BLOGSNAILS at the checkout, the code is valid until the end of November. Remember too that all our skin types are different so don't forget to read all the blurb before you order and if snails not for you they have plenty of alternatives. If you order any let me know what you think and make sure you don't let anyone else get their hands on it! * I was sent this product for review but all thoughts and opinions are 100% my own. Oh this sounds interesting! I must admit the name kinda puts you off, but it sounds amazing.. I might get some for Mark for christmas lol especially at that price!